I seldom wear black. But I have this black T-shirt I put on two times a year — once for the Tiananmen Square Massacre commemoration on 4 June and the other for the pro-democracy protest on 1 July. Over the years, this T-shirt, the only piece of black clothing I own, has come to symbolize both sadness and discontent. Since C.Y. Leung moved into the Government House in 2012, I have been wearing my black T-shirt a lot more. If it wasn’t for a mass protest against the national education curriculum, it was for a demonstration in support of HKTV’s bid for a broadcasting license. There seems to be plenty of sadness and discontent to go around these days. Surely enough, yesterday morning I found myself once again rummaging through the closet looking for my protestor’s uniform, this time to defend the future of our press freedom. With a heavy heart, I slipped the black thing over my head and made my way to Tamar. What happened this past Wednesday has shocked the city to the core. 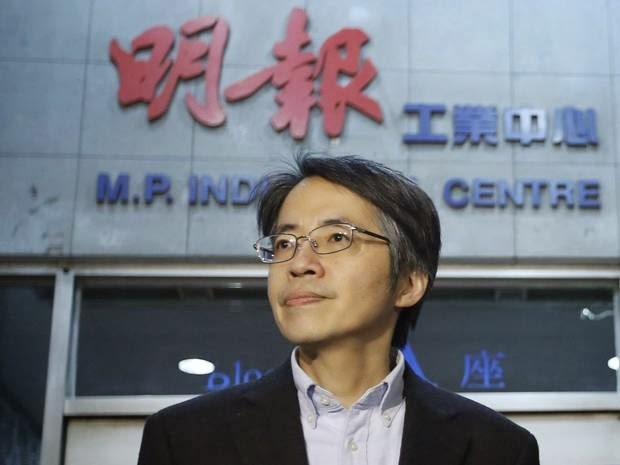 Kevin Lau (劉進圖), former editor-in-chief of Ming Pao — one of the city’s major Chinese language newspapers — was attacked by two knifemen on his way to breakfast in Sai Wan Ho. We don’t know which is worse: that Lau was stabbed six times in his back and legs, or that it took place in public and in broad daylight. The assault reeks of the brazenness we expect only in the Mexican drug war or a turf battle between rival gangs in Russia. 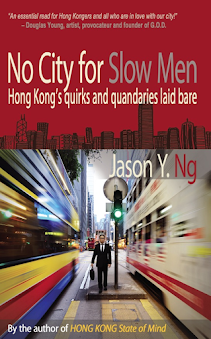 It makes Hong Kong, one of the safest international cities in the world, look like a lawless backwater. Violence against the press is not unheard of in our city. There were a handful of high profile incidents in the past two decades. 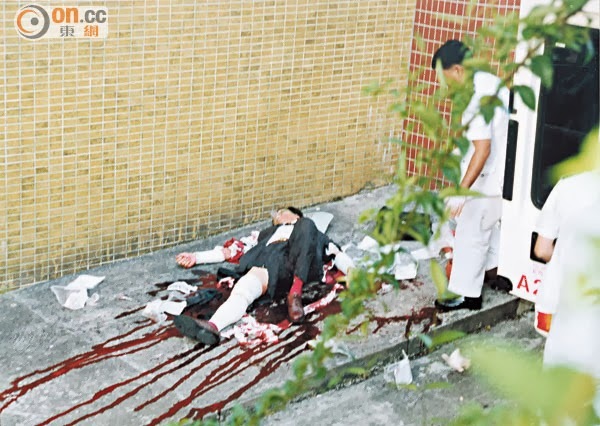 In May 1996, for instance, tabloid magazine publisher Leung Tin Wai (梁天偉) had his left forearm and both thumbs chopped off by attackers right in his office. Two years later in 1998, an equally vicious attack left Albert Cheng (鄭經翰), outspoken businessman and politician, hospitalized for two months. Just last year, Chen Ping (陳平) of iSun Affairs (《陽光時務週刊》), Jimmy Lai (黎智英) of The Apple Daily and Shih Wing Ching (施永青) of AM730 were either attacked or issued death threats. As recently as last month, firebrand radio talk show host Tam Tak Chi (譚得志), better known by his nickname Fast Beat (快必), was roughed up by a group of men outside his studio. These violent episodes all have one thing in common: the crime never gets solved. Despite offers of multi-million dollar rewards, the bad guys go free and the police investigation goes cold after a few months. Even if the police manage to capture the assailants, perhaps with the help of eyewitnesses and security cameras, they won’t find out who the mastermind behind the attack is, ever. But we can’t pin all the blame on law enforcement. In this day and age, a text message and the target’s headshot are all it takes to order a hit. Anonymity has emboldened the cowardly; technology has enabled the mercenary. That puts journalists — people who make a living upsetting the apple cart — in an ever vulnerable position. When there isn’t much else the police can do, the burden of crime investigation falls on the shoulders of the journalists themselves. 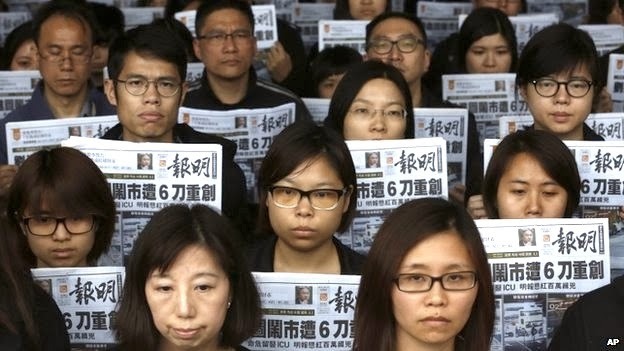 Ming Pao staff is currently sifting through dozens of news stories overseen by Kevin Lau before he was let go by the newspaper in January (his termination is a whole other story) to identify what might have gotten the editor in trouble. 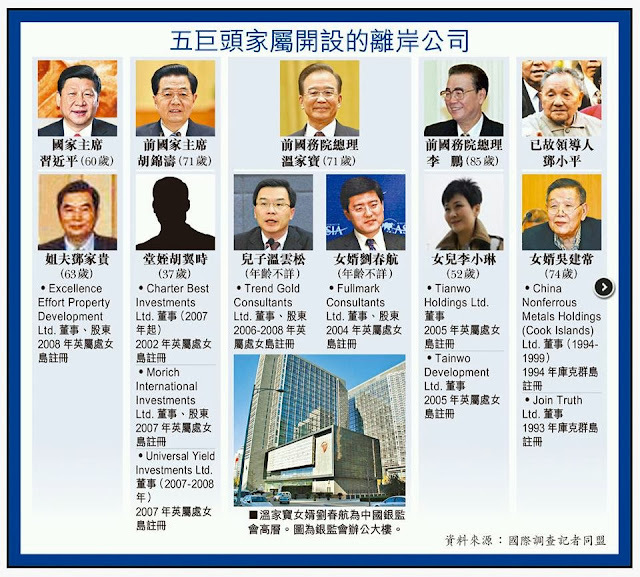 Among the possible culprits, the one that has generated the most interest is Lau’s exposé about offshore assets stashed away by Beijing’s ruling elite. Written in collaboration with the International Consortium of Investigative Journalists (ICIJ), the story is believed to have ticked off some powerful big wigs up north. So far, the ICIJ has found no evidence linking the attack to the investigative report and so the guessing game continues. Whoever ordered the hit on Lau, however, probably hadn’t quite thought the whole thing through. If it’s vengeance, then why not take him out altogether but instead let him live to tell the tale? If it’s intimidation, why wait until after the news report has already been published? And why go after an editor who has already left his job? None of it seems to make much sense to us. Then again, the scariest thing about thugs has always been their irrationality and tenuousness of a motive. Sometimes “just because” is reason enough to slash a person with a 12-inch knife. 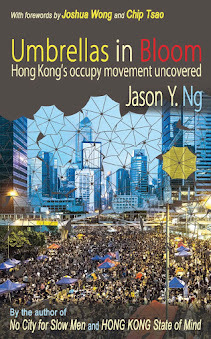 Whether it is intended or not, the people behind the brutal attack has made an example of Kevin Lau. The brutality and irrationality of it all has sent chills down the spine of every journalist in the city. For if it was Lau last Wednesday, it could be you and me tomorrow. It is not so much that all investigative reports will invite a deadly reprisal but that they might. It is not so much that reporters must look over their shoulders before breaking a story but that they feel they should. The attack on Lau has given journalists one more thing to think about before they hit that “send” button, something that they didn’t need to think about heretofore. The mere possibility of violence has cast a dark shadow over their desks. And so to those who question what the stabbing of one man has got to do with the press freedom of the entire city — I won’t name any names — and to those who wonder why “expert analysts” are needed to get to the bottom of the heinous crime — they know who they are — here is their answer. 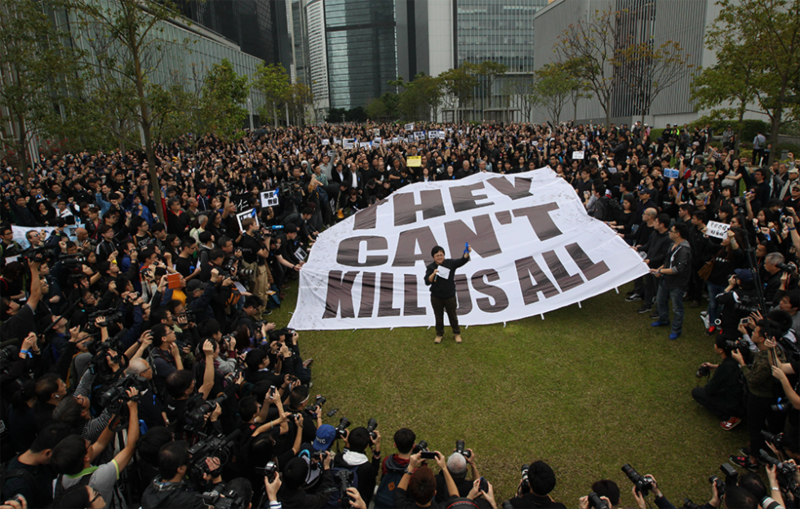 Yesterday’s rally began at the government complex in Tamar and ended at the nearby police headquarters. There were thousands of participants, all dressed in black, many of them reporters and journalism students. They carried placards bearing the words “They can’t kill us all,” a phrase borrowed from the infamous Kent State University shootings in 1970 in one of the darkest chapters in 20th Century American history. The choice of words is apt, for last Wednesday may well be one of the darkest days in post-Handover Hong Kong. 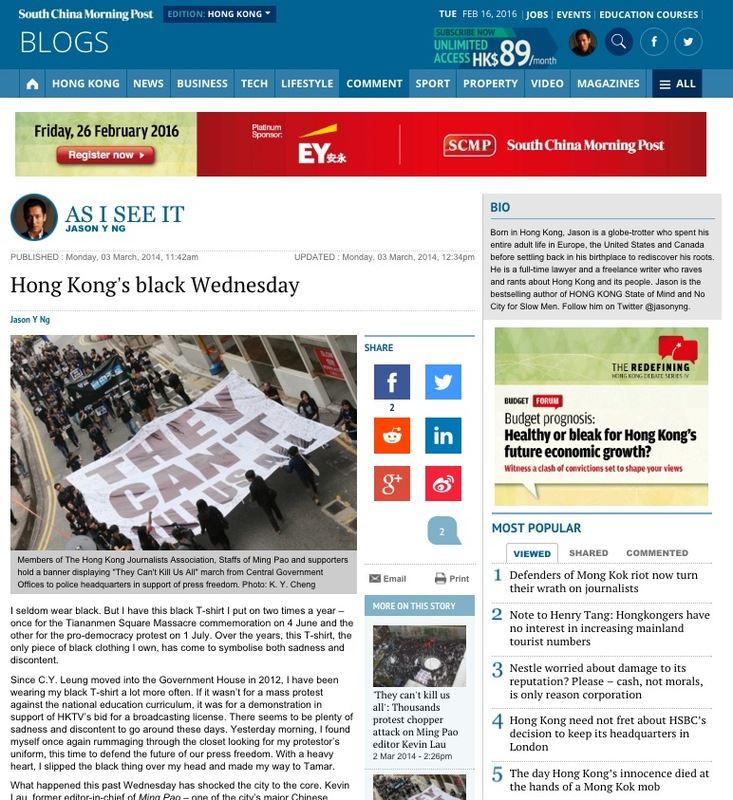 And so there I was, once again in my black T-shirt, chanting slogans and praying for Lau’s recovery, all the while looking at a city that suddenly felt a bit foreign to me. This article was published on SCMP.com under the title "Hong Kong's black Wednesday."